Five surprising facts from Robert Forster’s unforgettable memoir, Grant & I. The 1980s songwriting partnership of Grant McLennan/Robert Forster was a little like an Australian John Lennon/Paul McCartney. The pair wrote all The Go-Betweens' distinctively original material and, like their more famous counterparts, shared the credits and alternated on lead vocals; both also played guitar. Grant & I is Forster’s extraordinary portrait of this intense, creative, sometimes fraught friendship – a genuine meeting of artistic minds. 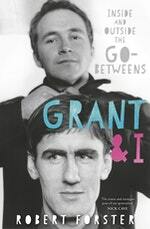 Wise, witty, poignant, insightful, self-deprecating and knowledgeable, channelled through Robert Forster’s unforgettable storytelling, Grant & I shines light on all the ups, downs, hits and missteps of life in The Go-Betweens. Here are just five of the many insights we gained from the pages of the book. ‘Did you write that?’ she asked me in the garden. To hear such words coming from my aunt. I am Robert Derwent Garth Forster. Destiny had tapped, a pat to encourage stirring feelings I had of being someone with a gift for words. [Dylan’s description] got me thinking of descriptions for our music. A few weeks later I came up with ‘that striped sunlight sound’. It was a Brisbane thing, to do with sun slanting in through windows onto objects in a room, and the feelings that evoked. Years before, I’d taken photos of the Suzuki leaning against a wall with the sun on its honey-coloured body, and somehow all of this got linked to the sound The Go-Betweens made. We stuck this description onto the sleeve of our single as an answer to an imagined interview. The phrase endured, and became a term referencing a bright poppy Brisbane sound with winsome or witty lyrics attached, which our first single helped to inspire. Soon a car arrived, a white second-hand Corolla – a gift from his mother. It was strange to see Grant behind the wheel, it just didn’t seem right for him to have so much hands-on engagement with the world; stranger still to be a passenger as he drove me through the western suburbs. We were close to Golding Street one afternoon, not long after the car’s delivery, when the engine began to splutter. Grant managed to guide the vehicle into a ditch. A look at the dashboard showed the problem. No petrol. He didn’t know you had to put it in. He probably thought you could drive the car forever. We walked home, and with my car in repair we had to hitchhike that night, appropriately enough, to a beatnik-themed Tom Waits show at the university. The next morning we returned with a can of petrol to find the car gone. Stolen. Grant never drove again. His life one tank of gas. Go Between is the result of 5800 responses from a community vote in August and September 2009. The name is also a tribute to The Go-Betweens; an internationally influential band from Brisbane. The bridge was officially named by founding member Robert Forster, and six other members of The Go-Betweens, at the Community Market Day on Sunday, 4 July 2010, the day before the bridge opened to traffic. He waited a few seconds, letting the name ring in his head. Thirty-two years later and five hundred metres downriver, I would open the Go Between Bridge, the first new bridge to span the centre of Brisbane in forty years. The first verse of the song rang out as she walked onto the set. Walsh explained the context of the music and the name of the group who’d made the record. Then, with a raised eyebrow to the camera and a theatrical clearing of the throat, he read out the lyrics to the second verse. ‘“She was in The Omen with Gregory Peck/ She got killed but what the heck/ Her eyes are like gems/ She’s an actress for Screen Gems.”‘ I was being humiliated on national television. Lee smiled coolly; having met the song’s author that day, she knew his sincerity. The creation of Grant & I was assisted by the Australian Government through the Australia Council for the Arts, its arts funding and advisory body. 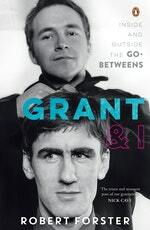 Grant & I is the story of the friendship and collaboration of Grant McLennan and Robert Forster, who gave Australia The Go-Betweens, one of our best and most influential bands. It was named Book of the Year 2017 by Mojo and Uncut magazines.